It’s finally March! Considering I live in a place where we have summer weather for at least 90% of the time, I have no complaints when it comes to the cold weather. My apologies in advance if you live somewhere where the cold has been unbearable and the only thing you want to do is lay in bed and drink hot chocolate. I am throwing some smiling sun emojis at you. 6. Benefit’s Roller Lash mascara ($24 at Sephora.com) – I also finally managed to get my hands on this baby and will be posting a review on it soon! The Too Faced Chocolate Bar palette has been on my wishlist for a while but that Tarte palette is gorgeous, I think that may have to go on it too! 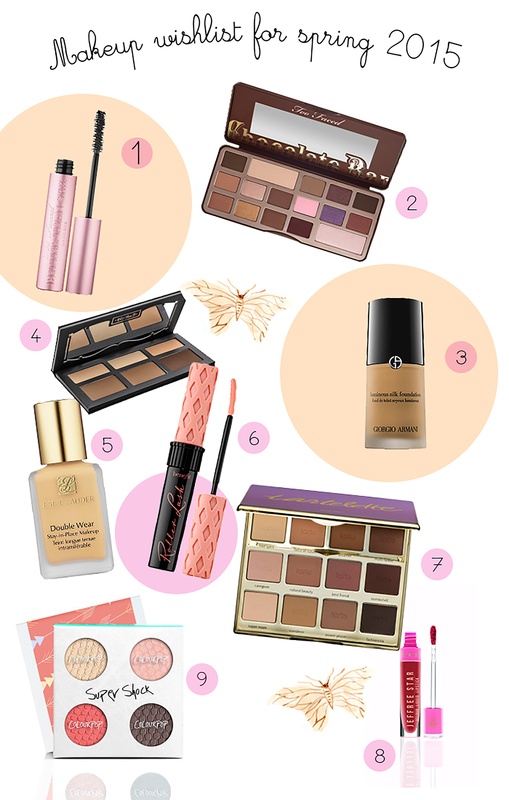 I haven’t tried Tarte as I find it hard to get in the UK but have heard good things about them and neutral palettes are a bit of a weakness of mine. That Tarte palette is to die for, am I rite or amirite? That was me trying to be funny. ANYWAY. YES. I love the packaging and those plum shades make me go all heart eyes. Who doesn’t love a good ol’ neutral palette? I feel your pain.